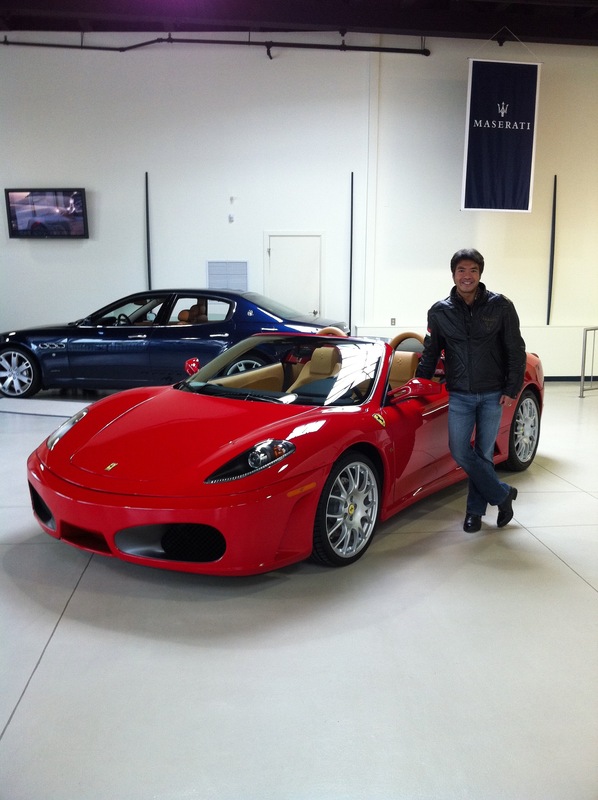 When I was in my late 20s I got my first house; thereafter, I purchased my first Ferrari. The 1988 Ferrari 328 GTS. It was my dream car; and, one of the major accomplishments in my life; sure, buying my first house was a big deal, but I thought of that as more as something like buying shoes, clothes, groceries, and so on — necessities in life — you know, practical stuff that isn’t a toy. My father introduced me to my first Ferrari when I was about 8 years old; and, I fell in love with the marquee. I read tons of books on Enzo Ferrari and his dream of being the best racer in the entire world. He, like my father, believed and taught me about effectuating any dreams I had; and, as I grew up, with my father’s guidance, his words rang true for me to this day. Enzo Ferrari favored “the  [horses] pulling the cart.” In other words, he favored front-engine Ferraris; and, the engines he favored were the big 12-cylinder engines. During the vintage years of his racing career with Alfa Romeo, FIAT, and eventually his own racing team, Scuderia Ferrari, all his race cars were front engines; and, he carried that theme into his production of his street-model Ferraris. By the way, the Ferraris you see on the road that have the SF shields on the front side panels of the cars stand for Scuderia Ferrari — Team Ferrari. If Enzo was alive today, he would not have let those cars have those shields — the SF shields were reserved for his race-cars — today, the executives at Ferrari use those shields as a marketing option, which costs about $20,000 to have on the car when you order a car. In the 1960s, his son, Dino, entered the business of Ferrari, and he changed things up — unlike his father, Enzo, Dino didn’t believe in the “horses pulling the cart.” He believed that the engines should be in the rear before the rear axles of the cars; hence, he created the mid-engine Ferraris; and, to boot, unlike his father, Dino liked smaller engines, such as the 4-cyliders, 6-cylinders, and 8-cylinders. Enzo would eventually settle in on the 8-cylinders in the early to mid-1970s. After the mid-1970s, all the Ferraris produced were either 12-cylinders or 8-cylinders. To date, the mid-engine 8-cylinder Ferraris are the most popular products coming out of The Factory in Maranello, Italy. In fact, they were the cars that saved the Ferrari company from going out of business. From that point on, as a young teenager, I would follow my father’s instructions — I prayed every single night asking, God to help me get my Ferrari. I begged Him with all my mind, heart, and soul; then, the next day, I would follow my father’s instructions and worked hard at whatever he told me to do. Years had passed since that conversation with my father; and, finally, I was financially at a point to purchase my first Ferrari. My father sat me down, and we talked about going to the Ferrari dealership with my check-book in hand — one of the requirements my father had was, “all luxury items must be paid in cash — no loans nor credit cards — if you can’t afford a toy, don’t buy it.” My father hated debt — other than a mortgage, everything in our house was purchased in cash. We talked for several hours, and after I calmed down, we met with my father’s real estate agent, and I purchased my first house. Ha — my father was on a covert mission — he had it in his directives for me to use that money to purchase my first house instead of my first Ferrari. When my father was on a mission, he always successfully completed it. It still boggles my mind that he had it all set up with the real estate agent and the property I was gonna buy without my knowledge of it prior to his discussion. My Ferrari was on hold until I can make the money again to purchase one. So, I moved out of home and into my brand new house. Each day, when I went into my garage (paddock), instead of seeing a Ferrari, I saw my trusted Jeep, and I drove to work each day — applying all that I learned from my father: pray to God, take the revenue from my corporate job and invest it; save my profits and invest a portion of it back into the market; and, stay focus on my goals, which was to get my first Ferrari. While my buddies in their 20s were partying, going to concerts, going to movies, going to dinner, going on dates, and getting laid; I worked, invested, saved my money, and I stayed focus — this was one of my father’s principles towards success: “Know What You Want.” I didn’t have girlfriends; I didn’t spend my money on beer, bars, hi-fi equipment, dinners, movies, concerts, nor any other stuff that would distract me from my Ferrari goal. I gave up my 20s because I wanted my Ferrari while I was still young. Finally, after two or three years, I had the money — $120,000 (that was a lot of money back then; and, the price of my Ferrari was about $88,000, not including registration, taxes, and so on). I went back to my father, and I showed him my banking account; and, I asked him, “Pappy, I have the money to purchase my Ferrari, can we go to buy one.” He smiled. The visual presence of my first Ferrari or any Ferrari for that matter is seductively mesmerizing — each line and curve, no matter the size or placement, has a distinct function either artistically or functionally. It is a rolling, working, and functional piece of art — from the wheels to the engine to the buttons in the cockpit — all are artistically created with form and function. I never get tired of looking at a Ferrari or listening to the engine. I drove around without a radio for many years…eventually, I put one in; because, the chicks I dated liked to listen to music when I took them away to Carmel or Napa for the weekend. 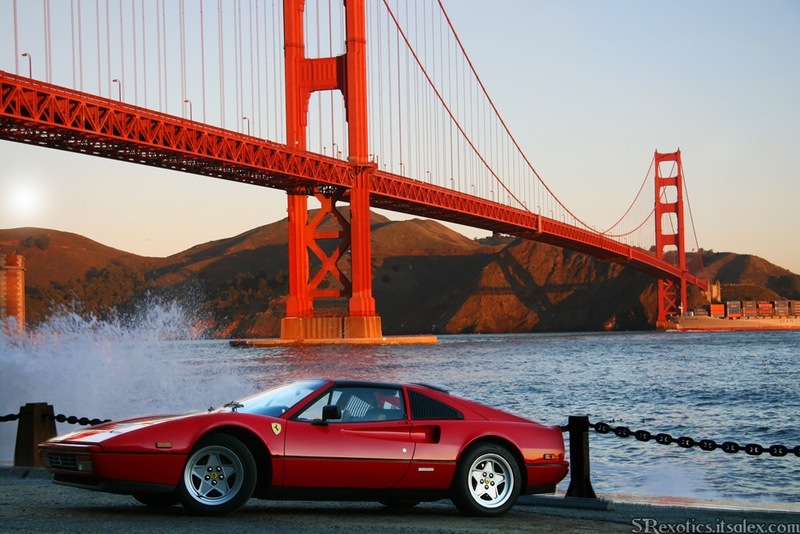 By the way, the picture above is my first Ferrari used as a model in front of the Golden Gate Bridge for a photographer’s portfolio. The photographer’s name is SRExoticsItsAlex.com. I don’t know if he is still a shooter — this shot was taken in 2008. 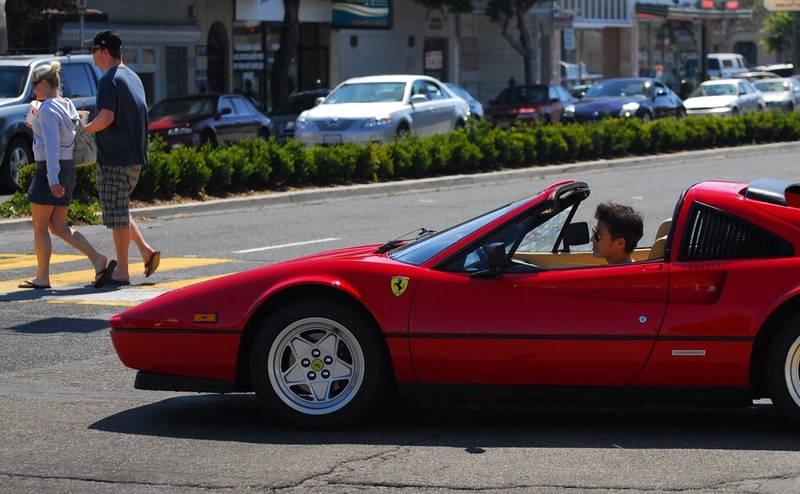 After 20 years of owning the Ferrari 328 GTS, I decided to trade it in for the new 2005 3-Pedal Ferrari F-430 Spyder. Purchasing a new Ferrari is a lot of fun. 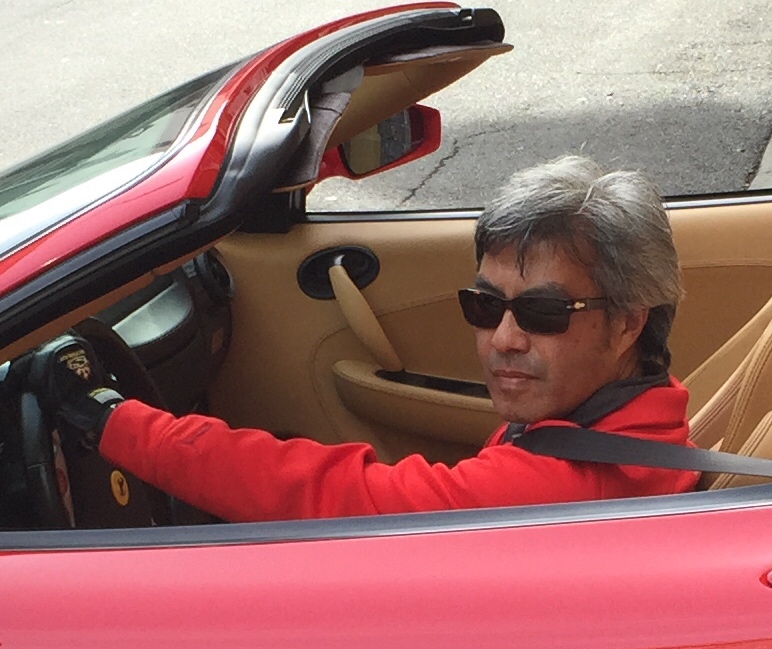 I picked out the leather and all the options I wanted — do you see the SF shield on the left front pane of my Ferrari F-430 Spyder in the picture above? As I mentioned earlier, that shield is Enzo’s racing logo for Scuderia Ferrari — Team Ferrari. Many Ferrari purists disapprove of that shield on these Ferraris; because, that shield was reserved for 12-cylinder racing Ferraris. After I discussed my wish-list to the sales consultant at Ferrari, the order goes out to Ferrari factory in Maranello (The Factory). The Ferrari people start building my Ferrari. All Ferraris are hand-made — the engine, the chassis, the body, and the coach-work. All my Ferraris are red exterior, tan interior, and spyders (convertibles). Also, all my Ferraris are 3-pedals: clutch, brakes, and accelerator. My father always told me, “you’re first Ferrari must be red.” Well, it turned out all my Ferraris ended up being red. Once my Ferrari came in, the sales consultant calls me, and I fly to the dealership. The dealership driver picks me up at the airport, and I meet up in the office to discuss the details. 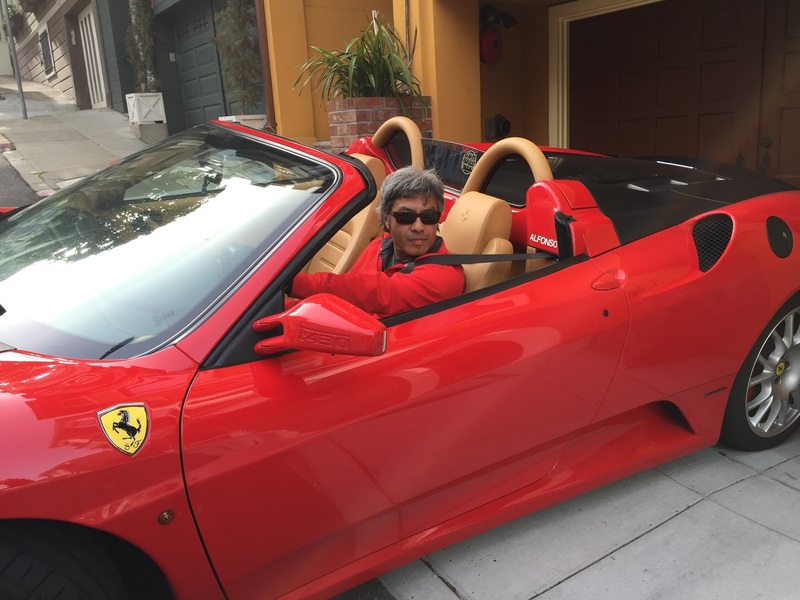 After I check out my Ferrari, I approve it, make payment, sign the paperwork, get the keys, shake hands with sales consultant, and I drive off the showroom to my paddock (AKA: garage) in San Francisco. I am an English Equestrian Jumper. Horses stay in paddocks; I treat my cars like my horse; hence, my car stays in the paddock. 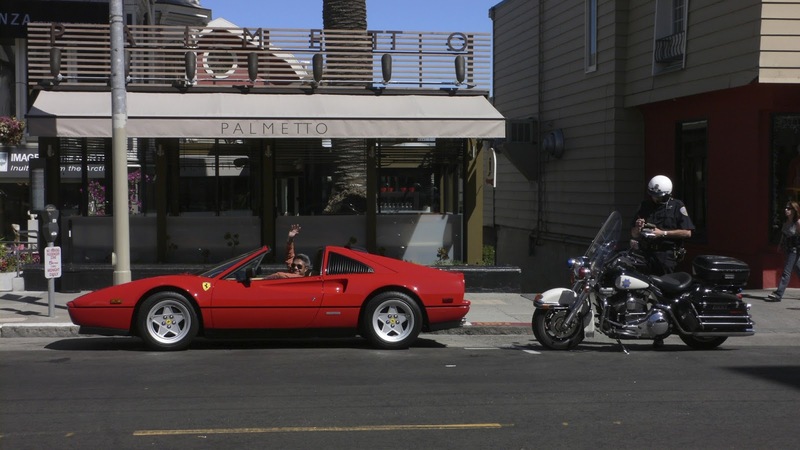 For me, that’s part of the fun…driving from the showroom to my paddock in San Francisco. If I didn’t want to drive my second new Ferrari to my paddock, the dealership would have transported my it to my paddock. Presently, I’m in the market for my third new Ferrari; however, my mum and sis recommend that I pick up a Lamborghini instead, because they think I should change it up a bit. Hmm…I don’t know…I’ve owned Ferraris for over 20 years…though, that Bull sure does look perrty! Great articl Alfonso! My dream is to own a Ferrari too some day in the near future! Inspiring! The pics which you have captured are great and I really adore its exterior car parts. It stylish front bumper, steering wheel as well as tires are making me crave for it even more. Thank you, so much! It so nice to meet another Ferrari fan!